For my Happiness Anniversary, this year, I got myself a brand new job. Ok, it was two days late and a job isn’t really a gift. But it’s the thought that counts. We’ll see how things go, but the position (Learning Technology Advisor) is right in line with things I already enjoy doing. Such as enabling technological appropriation in learning contexts. And holding thoughtful group discussions on interesting issues. And trying out new tools. And discussing learning objects and learning objectives. All things I’d probably do, regardless of my employment status. So the work itself is likely to be very satisfying. It’s been a while since I’ve had a fulltime dayjob. Years. Not that I haven’t been employed fulltime during that period. I did cumulate quite a few hours of work, most years. But they were part of different jobs, contracts, contexts. Which means that very significant a part of my “bandwidth” had to do with professional development. It also meant that my status tended to fluctuate. Teaching part-time was a large part of it, but a major distinction between part-time workers and fulltime ones relates to identity, status, recognition. For instance, sharing an office with a few colleagues is quite different from having your own. I start my new job Tuesday, so I’ll know more by then (such as the office situation). But I’m already getting different interactions with people, such as this one teacher who says that we now have good reasons to be even better friends. What’s funny is that the onset of my 2008 Happiness Phase coincided with my shift to freelancing. Had been doing several different things before that, mostly revolving around teaching and learning. But, from that point on, I allowed myself to take on contracts as a freelancer. I was no longer a Ph.D. candidate trying to squeeze in some work opportunity in view of an academic job. I was in control of my professional life, despite all the difficulties associated with freelancing. Overall, I learnt a lot. Much of it will be useful in fulltime work. Though the job is fulltime, it’s based on a renewable contract. When, during the job interview, the HR advisor asked me for my thoughts on this situation, my whole freelance experience was behind me. No, it’s not an issue. I’ll manage even if it’s not renewed. But I’m starting a new life. Something else about this new life connects to 2008. It’s in a Cegep. Cegeps are Quebec public colleges for both vocational and pre-university education. I care deeply enough about the Cegep system to defend it. More than once. It’s occasionally under attack by politicians who try to stir things up. But it’s a part of post-secondary education in Quebec which makes it unique. Having taught in diverse places, I find that it makes a significant improvement in university life here. It also enables the kinds of training and learning that people really need, as “adulteens” (very young adults who are also “teen-aged”). In the past week, even before settling down in my new position, I got to see some impressive things happening in Cegeps. I sincerely think that cegeps are an example to follow, not an anomaly. Similar systems exist elsewhere (from “gymnasium” and “international baccalaureate” to “prep schools” and “community colleges”). But Quebec’s Cegep network is its own very specific thing, fully adapted to its own cultural and social context. Surely, I’ll have a lot more to say about Cegeps as I work in one. …when it suddenly hit me: I could work in a Cegep. Can still remember the overwhelming feeling of comfort I experienced when that thought hit me. It was so obvious! So fitting! Sure, there’d be some difficulties, but nothing impossible. I was ready, then, to embark in a Cegep career. It’s not what happened, right away. I came back to Quebec from Texas and applied to a few things in Cegeps. Was getting other contracts, including teaching contracts at Concordia (where I started teaching in 2006). Never abandoned the idea of working in a Cegep but “life had other plans”, at the time. I did do several things which got me closer to the Cegep system. Including participations in every MoodleDay event at Dawson. And workshops with Cegep institutions. I even participated in a living lab on educational innovation with the very organization which just hired me (lab summary in French). Without really noticing it, I was preparing myself to join the Cegep World. One obvious possibility was to add Cegep courses to my part-time teaching load or eventually becoming fulltime as a Cegep teacher. Cegep teaching has clear advantages over university teaching. Simply put, Cegep teachers are allowed to care about learning. University professors who care about pedagogical issues bump into lots of hurdles. Since I care a whole lot about teaching (and I can still do actual research without a tenured position), it sounded like the right place for me. Friends and acquaintances who work in Cegeps kept telling me things which made the fit even more obvious. Though grades do matter in Cegeps, the obsession with grades is much less of an issue in Cegeps than in universities. I care enough about this that I co-organized a public conversation on grades, back in November 2013. Of course, the Cegep population is quite different (and often younger) than the university population. Having taught in the US where people enter university or college directly from high school, I didn’t think it’d be an issue. But teaching Cegep students directly wasn’t the only option. Having accumulated some expertise on post-secondary learning through 15 years of teaching experience, I was starting to think about being a learning advisor of some sort. This is finally happening, officially. I’ve often acted as an informal advisor for people. Even during my M.Sc., I would discuss a Ph.D. student’s research in pretty much the way an advisor would. Not the advisor who focuses on logistics and rules and citation impact. But the person who challenges you to rethink a research question or brings you to think of your whole project in a completely new way. Since then, I’ve done the same thing numerous times without ever having an official title to go with it. I’d occasionally get a bit of (informal) credit for it, but I wasn’t aiming for that. I just enjoy helping people in this way. I also became something of a mentor to some people. For instance, in view of a pilot project at Concordia, I was able to mentor two teaching assistants who were holding classes in parallel with me. The mentoring included tips and tricks about classroom management along with deeper things on the meaning of university learning. It was still a limited scope, but it was in line with things I wanted to do. What was even more fitting, given my new position, is that I became the “go-to person” for several things having to do with technology in learning and teaching. This all started in 2007 when, through the Spirit of Inquiry conference, I started collaborating with Concordia’s Centre for Teaching and Learning Services. Created workshops, did screencasts, experimented with some solutions, answered informal questions… Without being employed directly by CTLS, I think it’s fair to say (as several people have been saying) that I was playing a key role in terms of learning technology at Concordia. There’s a pattern, here. From diverse activities as a freelancer, I now get to merge things to be Learning Technology Advisor at Vitrine technologie-éducation. I’m still in catchup mode (was sick during the break), but it’s hard to let this pass. It’s exactly the kind of thing I like to blog about: wishful thinking and speculation about education. Sometimes, my crazy predictions are fairly accurate. But my pleasure at blogging these things has little to do with the predictions game. I’m no prospectivist. I just like to build wishlists. In this case, I’ll try to make it short. But I’m having drift-off moments just thinking about the possibilities. I do have a lot to say about this but we’ll see how things go. Overall, I agree with the three main predictions in that MacWorld piece: Apple might come out with eBook creation tools, office software, and desktop reading solutions. I’m interested in all of these and have been thinking about the implications. That MacWorld piece, like most media coverage of textbooks, these days, talks about the weight of physical textbooks as a major issue. It’s a common refrain and large bookbags/backpacks have symbolized a key problem with “education”. Moren and Friedman finish up with a zinger about lecturing. Also a common complaint. In fact, I’ve been on the record (for a while) about issues with lecturing. Which is where I think more reflection might help. For one thing, alternative models to lecturing can imply more than a quip about the entertainment value of teaching. Inside the teaching world, there’s a lot of talk about the notion that teaching is a lot more than providing access to content. There’s a huge difference between reading a book and taking a class. But it sounds like this message isn’t heard and that there’s a lot of misunderstanding about the role of teaching. It’s quite likely that Apple’s announcement may make things worse. I don’t like textbooks but I do use them. I’m not the only teacher who dislikes textbook while still using them. But I feel the need to justify myself. In fact, I’ve been on the record about this. So, in that context, I think improvements in textbooks may distract us from a bigger issue and even lead us in the wrong direction. By focusing even more on content-creation, we’re commodifying education. What’s more, we’re subsuming education to a publishing model. We all know how that’s going. What’s tragic, IMHO, is that textbook publishers themselves are going in the direction of magazines! If, ten years from now, people want to know when we went wrong with textbook publishing, it’ll probably be a good idea for them to trace back from now. In theory, magazine-style textbooks may make a lot of sense to those who perceive learning to be indissociable from content consumption. I personally consider these magazine-style textbooks to be the most egregious of aberrations because, in practice, learning is radically different from content consumption. So… If, on Thursday, Apple ends up announcing deals with textbook publishers to make it easier for them to, say, create and distribute free ad-supported magazine-style textbooks, I’ll be going through a large range of very negative emotions. Coming out of it, I might perceive a silverlining in the fact that these things can fairly easily be subverted. I like this kind of technological subversion and it makes me quite enthusiastic. In fact, I’ve had this thought about iAd producer (Apple’s tool for creating mobile ads). Never tried it but, when I heard about it, it sounded like something which could make it easy to produce interactive content outside of mobile advertising. I don’t think the tool itself is restricted to Apple’s iAd, but I could see how the company might use the same underlying technology to create some content-creation tool. “But,” you say, “you just said that you think learning isn’t about content.” Quite so. I’m not saying that I think these tools should be the future of learning. But creating interactive content can be part of something wider, which does relate to learning. The point isn’t that I don’t like content. The point is that I don’t think content should be the exclusive focus of learning. To me, allowing textbook publishers to push more magazine-style content more easily is going in the wrong direction. Allowing diverse people (including learners and teachers) to easily create interactive content might in fact be a step in the right direction. It’s nothing new, but it’s an interesting path. In fact, despite my dislike of a content emphasis in learning, I’m quite interested in “learning objects”. In fact, I did a presentation about them during the Spirit of Inquiry conference at Concordia, a few years ago (PDF). A neat (but Flash-based) example of a learning object was introduced to me during that same conference: Mouse Party. The production value is quite high, the learning content seems relatively high, and it’s easily accessible. But it’s based on Flash. Which leads me to another part of the issue: formats. I personally try to avoid Flash as much as possible. While a large number of people have done amazing things with Flash, it’s my sincere (and humble) opinion that Flash’s time has come and gone. I do agree with Steve Jobs on this. Not out of fanboism (I’m no Apple fanboi), not because I have something against Adobe (I don’t), not because I have a vested interested in an alternative technology. I just think that mobile Flash isn’t going anywhere and that. Even on the desktop, I think Flash-free is the way to go. Never installed Flash on my desktop computer, since I bought it in July. I do run Chrome for the occasional Flash-only video. But Flash isn’t the only video format out there and I almost never come across interesting content which actually relies on something exclusive to Flash. Flash-based standalone apps (like Rdio and Machinarium) are a different issue as Flash was more of a development platform for them and they’re available as Flash-free apps on Apple’s own iOS. I wouldn’t be surprised if Apple’s announcements had something to do with a platform for interactive content as an alternative to Adobe Flash. In fact, I’d be quite enthusiastic about that. Especially given Apple’s mobile emphasis. We might be getting further in “mobile computing for the rest of us”. Part of this may be related to HTML5. I was quite enthusiastic when Tumult released its “Hype” HTML5-creation tool. I only used it to create an HTML5 version of my playfulness talk. But I enjoyed it and can see a lot of potential. Especially in view of interactive content. It’s an old concept and there are many tools out there to create interactive content (from Apple’s own QuickTime to Microsoft PowerPoint). But the shift to interactive content has been slower than many people (including educational technologists) would have predicted. In other words, there’s still a lot to be done with interactive content. Especially if you think about multitouch-based mobile devices. Which eventually brings me back to learning and teaching. I don’t “teach naked”, I do use slides in class. In fact, my slides are mostly bullet points, something presentation specialists like to deride. Thing is, though, my slides aren’t really meant for presentation and, while they sure are “content”, I don’t really use them as such. Basically, I use them as a combination of cue cards, whiteboard, and coursenotes. Though I may sound defensive about this, I’m quite comfortable with my use of slides in the classroom. Yet, I’ve been looking intently for other solutions. For instance, I used to create outlines in OmniOutliner that I would then send to LaTeX to produce both slides and printable outlines (as PDFs). I’ve thought about using S5, but it doesn’t really fit in my workflow. So I end up creating Keynote files on my Mac, uploading them (as PowerPoint) before class, and using them in the classroom using my iPad. Not ideal, but rather convenient. In all of these cases, the result isn’t really interactive. Sure, I could add buttons and interactive content to the slides. But the basic model is linear, not interactive. The reason I don’t feel bad about it is that my teaching is very interactive (the largest proportion of classtime is devoted to open discussions, even with 100-plus students). But I still wish I could have something more appropriate. I have used other tools, especially whiteboarding and mindmapping ones. Basically, I elicit topics and themes from students and we discuss them in a semi-structured way. But flow remains an issue, both in terms of workflow and in terms of conversation flow. So if Apple were to come up with tools making it easy to create interactive content, I might integrate them in my classroom work. A “killer feature” here is if interaction could be recorded during class and then uploaded as an interactive podcast (à la ProfCast). Of course, content-creation tools might make a lot of sense outside the classroom. Not only could they help distribute the results of classroom interactions but they could help in creating learning material to be used ahead of class. These could include the aforementioned learning objects (like Mouse Party) as well as interactive quizzes (like Hot Potatoes) and even interactive textbooks (like Moglue) and educational apps (plenty of these in the App Store). Which brings me back to textbooks, the alleged focus of this education event. One of my main issues with textbooks, including online ones, is usability. I read pretty much everything online, including all the material for my courses (on my iPad) but I find CourseSmart and its ilk to be almost completely unusable. These online textbooks are, in my experience, much worse than scanned and OCRed versions of the same texts (in part because they don’t allow for offline access but also because they make navigation much more difficult than in GoodReader). What I envision is an improvement over PDFs. Part of the issue has to do with PDF itself. Despite all its benefits, Adobe’s “Portable Document Format” is the relic of a bygone era. Sure, it’s ubiquitous and can preserve formatting. It’s also easy to integrate in diverse tools. In fact, if I understand things correctly, PDF replaced Display PostScript as the basis for Quartz 2D, a core part of Mac OS X’s graphics rendering. But it doesn’t mean that it can’t be supplemented by something else. Part of the improvement has to do with flexibility. Because of its emphasis on preserving print layouts, PDF tends to enforce print-based ideas. This is where EPUB is at a significant advantage. In a way, EPUB textbooks might be the first step away from the printed model. From what I can gather, EPUB files are a bit like Web archives. Unlike PDFs, they can be reformatted at will, just like webpages can. In fact, iBooks and other EPUB readers (including Adobe’s, IIRC) allow for on-the-fly reformatting, which puts the reader in control of a much greater part of the reading experience. This is exactly the kind of thing publishers fail to grasp: readers, consumers, and users want more control on the experience. EPUB textbooks would thus be easier to read than PDFs. EPUB is the basis for Apple’s iBooks and iBookstore and people seem to be assuming that Thursday’s announcement will be about iBooks. Makes sense and it’d be nice to see an improvement over iBooks. For one thing, it could support EPUB 3. There are conversion tools but, AFAICT, iBooks is stuck with EPUB 2.0. An advantage there is that EPUBs can possibly include scripts and interactivity. Which could make things quite interesting. Interactive formats abound. In fact, PDFs can include some interactivity. But, as mentioned earlier, there’s a lot of room for improvement in interactive content. In part, creation tools could be “democratized”. Which gets me thinking about recent discussions over the fate of HyperCard. While I understand John Gruber’s longstanding position, I find room for HyperCard-like tools. Like some others, I even had some hopes for ATX-based TileStack (an attempt to bring HyperCard stacks back to life, online). And I could see some HyperCard thinking in an alternative to both Flash and PDF. Well, yes. It may sound strange but there’s something about HyperCard which could make sense in the longer term. Especially if we get away from the print model behind PDFs and the interaction model behind Flash. And learning objects might be the ideal context for this. Part of this is about hyperlinking. It’s no secret that HyperCard was among HTML precursors. As the part of HTML which we just take for granted, hyperlinking is among the most undervalued features of online content. Sure, we understand the value of sharing links on social networking systems. And there’s a lot to be said about bookmarking. In fact, I’ve been thinking about social bookmarking and I have a wishlist about sharing tools, somewhere. But I’m thinking about something much more basic: hyperlinking is one of the major differences between online and offline wriiting. That list of advantages is one I’ve been using since I started to use this Wikibook… excerpt for the last one. And this is one which hit me, recently, as being more important than the others. So, in class, I talked about the value of links and it’s been on my mind quite a bit. Especially in view of textbooks. And critical thinking. See, academic (and semi-academic) writing is based on references, citations, quotes. English-speaking academics are likely to be the people in the world of publishing who cite the most profusely. It’s not rare for a single paragraph of academic writing in English to contain ten citations or more, often stringed in parentheses (Smith 1999, 2005a, 2005b; Smith and Wesson 1943, 2010). And I’m not talking about Proust-style paragraphs either. I’m convinced that, with some quick searches, I could come up with a paragraph of academic writing which has less “narrative content” than citation. Textbooks aren’t the most egregious example of what I’d consider over-citing. But they do rely on citations quite a bit. As I work more specifically on textbook content, I notice even more clearly the importance of citations. In fact, in my head, I started distinguishing some patterns in textbook content. For instance, there are sections which mostly contain direct explanations of key concepts while other sections focus on personal anecdotes from the authors or extended quotes from two sides of the debate. But one of the most obvious sections are summaries from key texts. As Nora Smith explained in her 1968 study Coming Up with Something to Say, the concept of interpretation has a basis in cognition. Smith (1968: 23) argued that Pierce’s interpretant had nothing to do with theatre. These citations are less conspicuous than they’d be in peer-reviewed journals. But they’re a central part of textbook writing. One of their functions should be to allow readers (undergraduate students, mostly) to learn more about a topic. So, when a student wants to know more about Nora Smith’s reading of Pierce, she “just” have to locate Smith’s book, go to the right page, scan the text for the read for the name “Pierce”, and read the relevant paragraph. Nothing to it. Compare this to, say, a blogpost. I only cite one text, here. But it’s linked instead of being merely cited. So readers can quickly know more about the context for what I’m discussing before going to the library. Better yet, this other blogpost of mine is typical of what I’ve been calling a linkfest, a post containing a large number of links. Had I put citations instead of links, the “narrative” content of this post would be much less than the citations. Basically, the content was a list of contextualized links. Much textbook content is just like that. In my experience, online textbooks are citation-heavy and take almost no benefit from linking. Oh, sure, some publisher may replace citations with links. But the result would still not be the same as writing meant for online reading because ex post facto link additions are quite different from link-enhanced writing. I’m not talking about technological determinism, here. I’m talking about appropriate tool use. Online texts can be quite different from printed ones and writing for an online context could benefit greatly from this difference. In other words, I care less about what tools publishers are likely to use to create online textbooks than about a shift in the practice of online textbooks. Use of open standards like HTML5 and EPUB (possibly a combination of the two). Completely cross-platform (should go without saying, but Apple’s track record isn’t that great, here). Mobile creation tools as powerful as desktop ones (more like GarageBand than like iWork). HyperCard-style emphasis on hyperlinked structures (à la “mini-site” instead of web archives). Focus on rich interaction (possibly based on the SproutCore web framework). Replacement for iWeb (which is being killed along with MobileMe). Deep integration with iTunes U. Combination of document (à la Pages or Word), presentation (à la Keynote or PowerPoint), and standalone apps (à la The Elements or even Myst). Full support for course management systems. Integration of textbook material and ancillary material (including study guides, instructor manuals, testbanks, presentation files, interactive quizzes, glossaries, lesson plans, coursenotes, etc.). Outlining support (more like OmniOutliner or even like OneNote than like Keynote or Pages). Mindmapping support (unlikely, but would be cool). Whiteboard support (both in-class and online). Collaboration features (à la Adobe Connect). Support for iCloud (almost a given, but it opens up interesting possibilities). iWork integration (sounds likely, but still in my wishlist). Embeddable content (à la iWork.com). Stability, ease of use, and low-cost (i.e., not Adobe Flash or Acrobat). Better support than Apple currently provides for podcast production and publishing. More publisher support than for iBooks. Geared toward normal users, including learners and educators. The last three are probably where the problem lies. It’s likely that Apple has courted textbook publishers and may have convinced them that they should up their game with online textbooks. It’s clear to me that publishers risk to fall into oblivion if they don’t wake up to the potential of learning content. But I sure hope the announcement goes beyond an agreement with publishers. Rumour has it that part of the announcement might have to do with bypassing state certification processes, in the US. That would be a big headline-grabber because the issue of state certification is something of wedge issue. Could be interesting, especially if it means free textbooks (though I sure hope they won’t be ad-supported). But that’s much less interesting than what could be done with learning content. And Wesch sure has been thinking about learning. Problem is, publishers and “user-generated content” don’t go well together. I’m guessing that it’s part of the reason for Apple’s insufficient support for “user-generated content”. For better or worse, Apple primarily perceives its users as consumers. In some cases, Apple sides with consumers to make publishers change their tune. In other cases, it seems to be conspiring with publishers against consumers. But in most cases, Apple fails to see its core users as content producers. In the “collective mind of Apple”, the “quality content” that people should care about is produced by professionals. What normal users do isn’t really “content”. iTunes U isn’t an exception, those of us who give lectures aren’t Apple’s core users (even though the education market as a whole has traditionally being an important part of Apple’s business). The fact that Apple courts us underlines the notion that we, teachers and publishers (i.e. non-students), are the ones creating the content. In other words, Apple supports the old model of publishing along with the old model of education. Of course, they’re far from alone in this obsolete mindframe. But they happen to have several of the tools which could be useful in rethinking education. Thursday’s events is likely to focus on textbooks. But much more is needed to shift the balance between publishers and learners. Including a major evolution in podcasting. Podcasting is especially relevant, here. I’ve often thought about what Apple could do to enhance podcasting for learning. Way beyond iTunes U. Into something much more interactive. And I don’t just mean “interactive content” which can be manipulated seamless using multitouch gestures. I’m thinking about the back-and-forth of learning and teaching, the conversational model of interactivity which clearly distinguishes courses from mere content. Here’s a slightly edited version of a message I sent about University of the Streets Café. I realize that my comments about it may sound strange for people who haven’t participated in one of their conversations. And there may be people who don’t like it as much as I do. But it’s remarkable how favourable people are to the program, once they participate in it. Having taught at eight academic institutions in the United States and Canada, I have frequently gone on record to say that Concordia is my favourite context for teaching and learning. By a long stretch. Concordia’s “University of the Streets Café” program is among the things I like the most about my favourite university. Over the past few years, I have been a vocal participant at a rather large number of “UnivCafé” events and have been the guest at one of them. Each of these two-hour conversations has provided me with more stimulation than any seminar or class meeting in which I participated, as a teacher or as a student. In fact, I have frequently discussed UnivCafé with diverse people (including several members of the Concordia community). As is clear to anyone who knows me, UnivCafé has had a strong impact on my life, both professionally and personally. Given my experience elsewhere, I have a clear impression of what makes Concordia unique. Inclusive attitude, embracing cultural and social diversity. Ease of building organic social networks through informal events. In a way, UnivCafé encapsulates Concordia’s uniqueness. Yet it goes further than that. Though it may sound hyperbolic to outsiders, I would not hesitate to say that UnivCafé captures some of the Greek academia (Ἀκαδημία) while integrating dimensions of contemporary life. More pithily: ”UnivCafé is a social media version of Plato‘s Academy”. It seems to me that academia is in a transition period. For instance, the tenure system could be rethought. With social and technological developments challenging many academic models, universities are often searching for new models. I sincerely hope that the UnivCafé model is a sign of things to come. I have discussed this on several occasions with students and colleagues, and this notion is gaining ground. Gives voice to people who are rarely heard. Exposes participants to a diversity of perspectives. Brings together people who rarely get a chance to interact. Integrates practical and theoretical concerns. Allays fears of public speaking. Builds valuable connections through the local community. Brings academics outside the Ivory Tower. As may be obvious, I could talk about UnivCafé for hours and would be happy to do so in any context. In the meantime, may this testimonial serve as a token of appreciation for all the things I have gained from UnivCafé. Pretty much any academic eventually feels that s/he is misunderstood. Misunderstandings about some core notions in about any academic field are involved in some of the most common pet peeves among academics. In other words, there’s nothing as transdisciplinary as misunderstanding. It’s not paranoia and it’s probably not self-victimization. But there almost seems to be a form of “onedownmanship” at stake with academics from different disciplines claiming that they’re more misunderstood than others. In fact, I personally get the feeling that ethnographers are more among the most misunderstood people around, but even short discussions with friends in other fields (including mathematics) have helped me get the idea that, basically, we’re all misunderstood at the same “level” but there are variations in the ways we’re misunderstood. For instance, anthropologists in general are mistaken for what they aren’t based on partial understanding by the general population. This may all sound like nitpicking but, from the inside, it’s quite impactful. Linguists are frequently asked about the number of languages they speak. Mathematicians are taken to be number freaks. Psychologists are perceived through the filters of “pop psych.” There are many stereotypes associated with engineers. Etc. 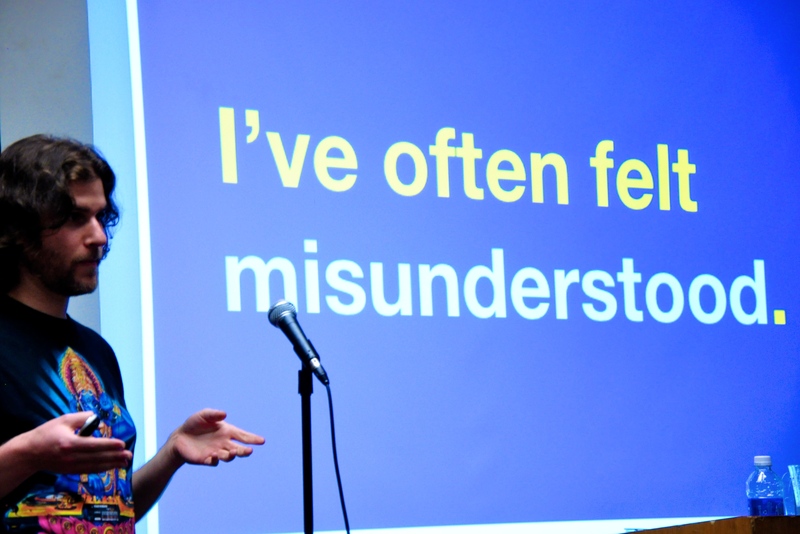 These misunderstandings have an impact on anyone’s work. Not only can it be demoralizing and can it impact one’s sense of self-worth, but it can influence funding decisions as well as the use of research results. These misunderstandings can underminine learning across disciplines. In survey courses, basic misunderstandings can make things very difficult for everyone. At a rather basic level, academics fight misunderstandings more than they fight ignorance. The main reason I’m discussing this is that I’ve been given several occasions to think about the interface between the Ivory Tower and the rest of the world. It’s been a major theme in my blogposts about intellectuals, especially the ones in French. Two years ago, for instance, I wrote a post in French about popularizers. A bit more recently, I’ve been blogging about specific instances of misunderstandings associated with popularizers, including Malcolm Gladwell’s approach to expertise. Last year, I did a podcast episode about ethnography and the Ivory Tower. And, just within the past few weeks, I’ve been reading a few things which all seem to me to connect with this same issue: common misunderstandings about academic work. The connections are my own, and may not be so obvious to anyone else. But they’re part of my motivations to blog about this important issue. A thread on a mailing-list about linguistic anthropology. A paleoanthropologist interviewed for a radio show discussed language and cognitive evolution in a way which seemed to some linguistic anthropologists as conveying some misunderstandings about language. Two posts on anthro blog Savage Minds, one on Facebook’s founders Mark Zuckerberg’s (mis)understanding of potlatch and gift economies. The other on broad ideas about “gift economies” among what some have called technolibtertarians. A blogpost about “Common Knowledge” by writer, editor, and teacher Alexa Offenhauer. A “linktrail” about language diversity, about which I blogged for the Society for Linguistic Anthropology. A podcast episode about sociology which included a discussion of the relationships between sociologists and journalists. Several things on my favourite academic blog, Language Log, which demonstrate the distance between popular and academic ideas about language. A Language Log piece (that I consider seminal) about “raising standards by lowering them” (and extending the conversation between experts and the general population). Some comments about para-academic by McGill psychologist Dan Levitin in his popular book on music cognition. My work as a teacher of both upper-level and intro courses. Diverse conversations with fellow academics. One discussion I remember, which seems to fit, included comments about Germaine Dieterlen by a friend who also did research in West Africa. Can’t remember the specifics but the gist of my friend’s comment was that “you get to respect work by the likes of Germaine Dieterlen once you start doing field research in the region.” In my academic background, appreciation of Germaine Dieterlen’s may not be unconditional, but it doesn’t necessarily rely on extensive work in the field. In other words, while some parts of Dieterlen’s work may be controversial and it’s extremely likely that she “got a lot of things wrong,” her work seems to be taken seriously by several French-speaking africanists I’ve met. And not only do I respect everyone but I would likely praise someone who was able to work in the field for so long. She’s not my heroine (I don’t really have heroes) or my role-model, but it wouldn’t have occurred to me that respect for her wasn’t widespread. If it had seemed that Dieterlen’s work had been misunderstood, my reflex would possibly have been to rehabilitate her. In fact, there’s a strong academic tradition of rehabilitating deceased scholars. The first example which comes to mind is a series of articles (PDF, in French) and book chapters by UWO linguistic anthropologist Regna Darnell.about “Benjamin Lee Whorf as a key figure in linguistic anthropology.” Of course, saying that these texts by Darnell constitute a rehabilitation of Whorf reveals a type of evaluation of her work. But that evaluation comes from a third person, not from me. The likely reason for this case coming up to my mind is that the so-called “Sapir-Whorf Hypothesis” is among the most misunderstood notions from linguistic anthropology. Moreover, both Whorf and Sapir are frequently misunderstood, which can make matters difficulty for many linguistic anthropologists talking with people outside the discipline. The opposite process is also common: the “slaughtering” of “sacred cows.” (First heard about sacred cows through an article by ethnomusicologist Marcia Herndon.) In some significant ways, any scholar (alive or not) can be the object of not only critiques and criticisms but a kind of off-handed dismissal. Though this often happens within an academic context, the effects are especially lasting outside of academia. In other words, any scholar’s name is likely to be “sullied,” at one point or another. Typically, there seems to be a correlation between the popularity of a scholar and the likelihood of her/his reputation being significantly tarnished at some point in time. While there may still be people who treat Darwin, Freud, Nietzsche, Socrates, Einstein, or Rousseau as near divinities, there are people who will avoid any discussion about anything they’ve done or said. One way to put it is that they’re all misunderstood. Another way to put it is that their main insights have seeped through “common knowledge” but that their individual reputations have decreased. Perhaps the most difficult case to discuss is that of Marx (Karl, not Harpo). Textbooks in introductory sociology typically have him as a key figure in the discipline and it seems clear that his insight on social issues was fundamental in social sciences. But, outside of some key academic contexts, his name is associated with a large series of social events about which people tend to have rather negative reactions. Even more so than for Paul de Man or Martin Heidegger, Marx’s work is entangled in public opinion about his ideas. Haven’t checked for examples but I’m quite sure that Marx’s work is banned in a number of academic contexts. However, even some of Marx’s most ardent opponents are likely to agree with several aspects of Marx’s work and it’s sometimes funny how Marxian some anti-Marxists may be. Typically, the “slaughtering of sacred cows” relates to disciplinary boundaries instead of social ones. At least, there’s a significant difference between your discipline’s own “sacred cows” and what you perceive another discipline’s “sacred cows” to be. Within a discipline, the process of dismissing a prior scholar’s work is almost œdipean (speaking of Freud). But dismissal of another discipline’s key figures is tantamount to a rejection of that other discipline. It’s one thing for a physicist to show that Newton was an alchemist. It’d be another thing entirely for a social scientist to deconstruct James Watson’s comments about race or for a theologian to argue with Darwin. Though discussions may have to do with individuals, the effects of the latter can widen gaps between scholarly disciplines. And speaking of disciplinarity, there’s a whole set of issues having to do with discussions “outside of someone’s area of expertise.” On one side, comments made by academics about issues outside of their individual areas of expertise can be very tricky and can occasionally contribute to core misunderstandings. The fear of “talking through one’s hat” is quite significant, in no small part because a scholar’s prestige and esteem may greatly decrease as a result of some blatantly inaccurate statements (although some award-winning scholars seem not to be overly impacted by such issues). On the other side, scholars who have to impart expert knowledge to people outside of their discipline often have to “water down” or “boil down” their ideas and, in effect, oversimplifying these issues and concepts. Partly because of status (prestige and esteem), lowering standards is also very tricky. In some ways, this second situation may be more interesting. And it seems unavoidable. How can you prevent misunderstandings when people may not have the necessary background to understand what you’re saying? This question may reveal a rather specific attitude: “it’s their fault if they don’t understand.” Such an attitude may even be widespread. Seems to me, it’s not rare to hear someone gloating about other people “getting it wrong,” with the suggestion that “we got it right.” As part of negotiations surrounding expert status, such an attitude could even be a pretty rational approach. If you’re trying to position yourself as an expert and don’t suffer from an “impostor syndrome,” you can easily get the impression that non-specialists have it all wrong and that only experts like you can get to the truth. Yes, I’m being somewhat sarcastic and caricatural, here. Academics aren’t frequently that dismissive of other people’s difficulties understanding what seem like simple concepts. But, in the gap between academics and the general population a special type of intellectual snobbery can sometimes be found. Obviously, I have a lot more to say about misunderstood academics. For instance, I wanted to address specific issues related to each of the links above. I also had pet peeves about widespread use of concepts and issues like “communities” and “Eskimo words for snow” about which I sometimes need to vent. And I originally wanted this post to be about “cultural awareness,” which ends up being a core aspect of my work. I even had what I might consider a “neat” bit about public opinion. Not to mention my whole discussion of academic obfuscation (remind me about “we-ness and distinction”). But this is probably long enough and the timing is right for me to do something else. I’ll end with an unverified anecdote that I like. This anecdote speaks to snobbery toward academics. As the story goes (at least, what I remember of it), some ethnographers had been doing fieldwork in an Australian cultural context and were focusing their research on a complex kinship system known in this context. Through collaboration with “key informants,” the ethnographers eventually succeeded in understanding some key aspects of this kinship system. As should be expected, these kinship-focused ethnographers wrote accounts of this kinship system at the end of their field research and became known as specialists of this system. After a while, the fieldworkers went back to the field and met with the same people who had described this kinship system during the initial field trip. Through these discussions with their “key informants,” the ethnographers end up hearing about a radically different kinship system from the one about which they had learnt, written, and taught. Quest for Expertise « Disparate. Interestingly enough, that post is getting a bit of blog attention. OLDaily ~ by Stephen Downes. Quest for Expertise – elearnspace. Trackbacks, pings, and blog comments are blogger gifts. (glaspell also commented on my blog entry). At this point, my impression is that what is taken as a “rule” on expertise is a simplification of results from a larger body of research with an emphasis on work by K. Anders Ericsson but with little attention paid to primary sources. The whole process is quite satisfying, to me. Not just because we might all gain a better understanding of how this “claim” became so generalized, but because the process as a whole shows both powers and limitations of the Internet. I tend to claim (publicly) that the ‘Net favours critical thinking (because we eventually all claims with grains of salt). But it also seems that, even with well-known research done in English, it can be rather difficult to follow all the connections across the literature. If you think about more obscure work in non-dominant languages, it’s easy to realize that Google’s dream of organizing the world’s information isn’t yet true. By the by, I do realize that my quest was based on a somewhat arbitrary assumption: that this “rule of thumb” is now understood as a solid rule. But what I’ve noticed in popular media since 2006 leads me to believe that the claim is indeed taken as a hard and fast rule. I’m not blaming anyone, in this case. I don’t think that anyone’s involvement in the “chain of transmission” was voluntarily misleading and I don’t even think that it was that essential. As with many other ideas, what “sticks” is what seems to make sense in context. Actually, this strong tendency for “convenient” ideas to be more widely believed relates to a set of tricky issues with which academics have to deal, on a daily basis. Sagan’s well-known “baloney detector” is useful, here. But it’s also in not so wide use. One thing which should also be clear: I’m not saying that Ericsson and other researchers have done anything shoddy or inappropriate. Their work is being used outside of its original context, which is often an issue. Mass media coverage of academic research was the basis of series of entries on the original Language Log, including one of my favourite blogposts, Mark Liberman’s Language Log: Raising standards — by lowering them. The main point, I think, is that secluded academics in the Ivory Tower do little to alleviate this problem. And I should probably reply to the other comments on the entry itself. Will at Work Learning: People remember 10%, 20%…Oh Really?. This post was mentioned on the mailing-list for the Society for Teaching and Learning in Higher Education (STLHE-L). In that post, Will Thalheimer traces back a well-known claim about learning to shoddy citations. While it doesn’t invalidate the base claim (that people tend to retain more information through certain cognitive processes), Thalheimer does a good job of showing how a graph which has frequently been seen in educational fields was based on faulty interpretation of work by prominent scholars, mixed with some results from other sources. Quite interesting. IMHO, demystification and critical thinking are among the most important things we can do in academia. In fact, through training in folkloristics, I have become quite accustomed to this specific type of debunking. I have in mind a somewhat similar claim that I’m currently trying to trace. Preliminary searches seem to imply that citations of original statements have a similar hyperbolic effect on the status of this claim. It takes ten years or 10,000 hours to become an expert in any field. The emerging picture from such studies is that ten thousand hours of practice is required to achieve the level of mastery associated with being a world-class expert – in anything. More recently, during a keynote speech he was giving as part of his latest book tour, I heard a similar claim from presenter extraordinaire Malcolm Gladwell. AFAICT, this claim runs at the centre of Gladwell’s recent book: Outliers: The Story of Success. In fact, it seems that Gladwell uses the same quote from Levitin, on page 40 of Outliers (I just found that out). I would like to pinpoint the origin for the claim. Contrary to Thalheimer’s debunking, I don’t expect that my search will show that the claim is inaccurate. But I do suspect that the “rule of thumb” versions may be a bit misled. I already notice that most people who set up such claims are doing so without direct reference to the primary literature. This latter comment isn’t damning: in informal contexts, constant referal to primary sources can be extremely cumbersome. But it could still be useful to clear up the issue. Who made this original claim? I’ve tried a few things already but it’s not working so well. I’m collecting a lot of references, to both online and printed material. Apart from Levitin’s book and a few online comments, I haven’t yet read the material. Eventually, I’d probably like to find a good reference on the cognitive basis for expertise which puts this “rule of thumb” in context and provides more elaborate data on different things which can be done during that extensive “time on task” (including possible skill transfer). But I should proceed somewhat methodically. This blogpost is but a preliminary step in this process. Simon coined a psychological law of his own, the 10-year rule, which states that it takes approximately a decade of heavy labor to master any field. Apart from the ten thousand (10,000) hours part of the claim, this is about as clear a statement as I’m looking for. The “Simon” in question is Herbert A. Simon, who did research on chess at the Department of Psychology at Carnegie-Mellon University with colleague William G. Chase. So I dig for diverse combinations of “Herbert Simon,” “ten(10)-year rule,” “William Chase,” “expert(ise),” and/or “chess.” I eventually find two primary texts by those two authors, both from 1973: (Chase and Simon, 1973a) and (Chase and Simon, 1973b). Behind this perceptual analysis, as with all skills (cf., Fitts & Posner, 1967), lies an extensive cognitive apparatus amassed through years of constant practice. The second Chase and Simon reference (1973b) is a chapter entitled “The Mind’s Eye in Chess” (pp. 215-281) in the proceedings of the Eighth Carnegie Symposium on Cognition as edited by William Chase and published by Academic Press under the title Visual Information Processing. I borrowed a copy of those proceedings from Concordia and have been scanning that chapter visually for some statements about the “time on task.” Though that symposium occurred in 1972 (before the first Chase and Simon reference was published), the proceedings were apparently published after the issue of Cognitive Psychology since the authors mention that article for background information. Maybe I haven’t scanned these texts properly but those quotes I find seem to imply that Simon hadn’t really devised his “10-year rule” in a clear, numeric version. I could probably dig for more Herbert Simon wisdom. Before looking (however cursorily) at those 1973 texts, I was using Herbert Simon as a key figure in the origin of that “rule of thumb.” To back up those statements, I should probably dig deeper in the Herbert Simon archives. But that might require more work than is necessary and it might be useful to dig through other sources. In my personal case, the other main written source for this “rule of thumb” is Dan Levitin. So, using online versions of his book, I look for comments about expertise. (I do own a copy of the book and I’m assuming the Index contains page numbers for references on expertise. But online searches are more efficient and possibly more thorough on specific keywords.) That’s how I found the statement, quoted above. I’m sure it’s the one which was sticking in my head and, as I found out tonight, it’s the one Gladwell used in his first statement on expertise in Outliers. So, where did Levitin get this? I could possibly ask him (we’ve been in touch and he happens to be local) but looking for those references might require work on his part. A preliminary step would be to look through Levitin’s published references for Your Brain On Music. This book was written for the non-specialist and not for my colleagues, and so I have tried to simplify topics without oversimplifying them. Because I wrote this book for the general reader, I want to emphasize that there are no new ideas presented in this book, no ideas that have not already been presented in scientific and scholarly journals as listed below. I have yet to read any of those references. I did borrow Ericsson and Smith when I first heard about Levitin’s approach to talent and expertise (probably through a radio and/or podcast appearance). But I had put the issue of expertise on the back-burner. It was always at the back of my mind and I did blog about it, back then. But it took Gladwell’s talk to wake me up. What’s funny, though, is that the “time on task” statements in (Ericsson and Smith, 1991) seem to lead back to (Chase and Simon, 1973b). is being further popularized by Malcolm Gladwell in late 2008. Of course, I’ll have to do a fair bit of digging and reading to verify any of this, but it sounds like the broad timeline makes some sense. One thing, though, is that it doesn’t really seem that anybody had the intention of spelling it out as a “rule” or “law” in such a format as is being carried around. If I’m wrong, I’m especially surprised that a clear formulation isn’t easier to find. As an aside, of sorts… Some people seem to associate the claim with Gladwell, at this point. Not very surprsing, given the popularity of his books, the effectiveness of his public presentations, the current context of his book tour, and the reluctance of the general public to dig any deeper than the latest source. The problem, though, is that it doesn’t seem that Gladwell himself has done anything to “set the record straight.” He does quote Levitin in Outliers, but I heard him reply to questions and comments as if the research behind the “ten years or ten thousand hours” claim had some association with him. From a popular author like Gladwell, it’s not that awkward. But these situations are perfect opportunities for popularizers like Gladwell to get a broader public interested in academia. As Gladwell allegedly cares about “educational success” (as measured on a linear scale), I would have expected more transparency. So, I have some work to do on all of this. It will have to wait but this placeholder might be helpful. In fact, I’ll use it to collect some links. Some relevant blogposts of mine on talent, expertise, effort, and Levitin. Money and (Musical) Talent? « Disparate. Play Behaviour and Performance « Disparate. Effort vs. Talent « Disparate. Late August Quickies « Disparate. Performance, Expertise, Ingenuity « Disparate. And a whole bunch of weblinks to help me in my future searches (I have yet to really delve in any of this). 10-year rule for exceptional performance « Diverse Thoughts. 10-Year Rule To Become A Expert. 20071117172260.THE 10 YEAR RULE.pdf (Objet application/pdf). Amazon Online Reader : Developing Talent in Young People. Amazon.com: Developing Talent in Young People: Benjamin Dr Bloom: Books. Amazon.com: Outliers: The Story of Success: Malcolm Gladwell: Books. Amazon.com: This Is Your Brain on Music: The Science of a Human Obsession: Daniel J. Levitin: Books. Anecdote: 10,000 hours to mastery. Computer Science – Teach Yourself Programming In Ten Years | DreamInCode.net. Expert – Wikipedia, the free encyclopedia. expert thinking — Britannica Online Encyclopedia. GranneBlog » It takes 10 years to develop expertise. How Long Does it Take to Become an Expert? (Philosophistry). How to Grow a Super-Athlete – New York Times. Malcolm Gladwell’s ‘Outliers’: well-written, thinly argued. Noise Between Stations » Feedback Leads to Expert Performance. Noise Between Stations » Want to Be An Expert? Practice for Ten Years. erfect: Why it takes 10,000 hours to be a success at anything, according to a top academic | Mail Online. Shikow: 10,000 hours = Magic Number to be an Expert at Anything. Teach Yourself Programming in Ten Years – 程序设计 – A Better Day. Teach Yourself Programming in Ten Years. The Cambridge Handbook of Expertise … – Google Book Search. The Expert Mind and the Interplanetary Bicycle Ride: Scientific American Podcast. The Scientific Curmudgeon » Blog Archive » “The Expert Mind” and Nature/Nurture. The secret of your success? 10,000 hours | News. thought :: Expert thinking and novice thinking — Britannica Online Encyclopedia. Washington Times – BOOKS: It all boils down to practice. Xona.com – Developing Talent in Young People (Benjamin Bloom). Hugh’s post reminded me of one of my favourite blogposts by an academic, a pointed defence of blogging by Mark Liberman, of Language Log fame. While I do agree with Hugh’s points, I would like to reframe and rephrase them. Clearly, I’m enthusiastic about blogging. Not that I think every academic should, needs to, ought to blog. But I do see clear benefits of blogging in academic contexts. Academics do a number of different things, from search committees to academic advising. Here, I focus on three main dimensions of an academic’s life: research, teaching, and community outreach. Other items in a professor’s job description may benefit from blogging but these three main components tend to be rather prominent in terms of PTR (promotion, tenure, reappointment). What’s more, blogging can help integrate these dimensions of academic life in a single set of activities. In relation to scholarship, the term “impact” often refers to the measurable effects of a scholar’s publication through a specific field. “Citation impact,” for instance, refers to the number of times a given journal article has been cited by other scholars. This kind of measurement is directly linked to Google’s PageRank algorithm which is used to assess the relevance of their search results. The very concept of “citation impact” relates very directly to the “publish or perish” system which, I would argue, does more to increase stress levels among full-time academic than to enhance scholarship. As such, it may need some rethinking. What does “citation impact” really measure? Is the most frequently cited text on a given subject necessarily the most relevant? Isn’t there a clustering effect, with some small groups of well-known scholars citing one another without paying attention to whatever else may happen in their field, especially in other languages? An advantage of blogging is that this type of impact is easy to monitor. Most blogging platforms have specific features for “statistics,” which let bloggers see which of their posts have been visited (“hit”) most frequently. More sophisticated analysis is available on some blogging platforms, especially on paid ones. These are meant to help bloggers monetize their blogs through advertising. But the same features can be quite useful to an academic who wants to see which blog entries seem to attract the most traffic. Closer to “citation impact” is the fact that links to a given post are visible within that post through the ping and trackback systems. If another blogger links to this very blogpost, a link to that second blogger’s post will appear under mine as a link. In other words, a blogpost can embed future references. In terms of teaching, thinking about impact through blogging can also have interesting effects. If students are blogging, they can cite and link to diverse items and these connections can serve as a representation of the constructive character of learning. But even if students don’t blog, a teacher blogging course-related material can increase the visibility of that course. In some cases, this visibility may lead to inter-institutional collaboration or increased enrollment. While secrecy may be essential in some academic projects, most academics tend to adopt a favourable attitude toward transparency. Academia is about sharing information and spreading knowledge, not about protecting information or about limiting knowledge to a select few. There are several ethical issues which relate to transparency. Some ethical principles prevent transparency (for instance, most research projects involving “human subjects” require anonymity). But academic ethics typically go with increased transparency on the part of the researcher. For instance, informed consent by a “human subject” requires complete disclosure of how the data will be used and protected. There are usually requirements for the primary investigator to be reachable during the research project. Transparency is also valuable in teaching. While some things should probably remain secret (say, answers to exam questions), easy access to a number of documents makes a lot of sense in learning contexts. It seems that the term “intellectual” gained currency as a label for individuals engaged in public debates. While public engagement has taken a different type of significance, over the years, but the responsibility for intellectuals to communicate publicly is still a matter of interest. Through blogging, anyone can engage in public debate, discourse, or dialogue. Scholars working with “human subjects” often think about reciprocity. While remuneration may be the primary mode of retribution for participation in a research project, a broader concept of reciprocity is often at stake. Those who participated in the project usually have a “right to know” about the results of that study. Even when it isn’t the case and the results of the study remain secret, the asymmetry of human subjects revealing something about themselves to scholars who reveal nothing seems to clash with fundamental principles in contemporary academia. Reciprocity in teaching can lead directly to some important constructivist principles. The roles of learners and teachers, while not completely interchangeable, are reciprocal. A teacher may learn and a learner may teach. Blogging makes it easy to try concepts out. More than “thinking out loud,” the type of blogging activity I’m thinking about can serve as a way to “put ideas on paper” (without actual paper) and eventually get feedback on those ideas. In my experience, microblogging (Identi.ca, Twitter…) has been more efficient than extended blogging in terms of getting conceptual feedback. In fact, social networks (Facebook, more specifically) have been even more conducive to hashing out concepts. Many academics do hash concepts out with students, especially with graduate students. The advantage is that students are likely to understand concepts quickly as they already share some of the same references as the academic who is playing with those concepts. There’s already a context for mutual understanding. The disadvantage is that a classroom context is fairly narrow to really try out the implications of a concept. A method I like to use is to use fairly catchy phrases and leave concepts fairly raw, at first. I then try the same concept in diverse contexts, on my blogs or off. The main example I have in mind is the “social butterfly effect.” It may sound silly at first but I find it can be a basis for discussion, especially if it spreads a bit. A subpoint, here, is that this method allows for “gauging interest” in new concepts and it can often lead one in completely new directions. By blogging about concepts, an academic can tell if this concept has a chance to stick in a broad frame (outside the Ivory Tower) and may be given insight from outside disciplines. This one probably applies more to “junior academics” (including students) but it can also work with established academics who enjoy diversifying their writing styles. Simply put: blogwriting is writing practise. A common idea, in cognitive research on expertise, is that it takes about ten thousand hours to become an expert. For better or worse, academics are experts at writing. And we gain that expertise through practise. In this context, it’s easy to see blogging as a “writing exercise.” At least, that would be a perspective to which I can relate. My impression is that writing skills are most efficiently acquired through practise. The type of practise I have in mind is “low-stakes,” in the sense that the outcomes of a writing exercise are relatively inconsequential. The basis for this perspective is that self-consciousness, inhibition, and self-censorship tend to get in the way of fluid writing. High-stakes writing (such as graded assignments) can make a lot of sense at several stages in the learning process, but overemphasis on evaluating someone’s writing skills will likely stress out the writer more than make her/him motivated to write. This impression is to a large extent personal. I readily notice that when I get too self-conscious about my own writing (self-unconscious, even), my writing becomes much less fluid. In fact, because writing about writing tends to make one self-conscious, my writing this post is much less efficient than my usual writing sessions. In my mind, there’s a cognitive basis to this form of low-stakes, casual writing. As with language acquisition, learning occurs whether or not we’re corrected. According to most research in language acquisition, children acquire their native languages through exposure, not through a formal learning process. My guess is that the same apply to writing. In some ways, this is a defence of drafts. “Draft out your ideas without overthinking what might be wrong about your writing.” Useful advice, at least in my experience. The further point is to do something with those drafts, the basis for the RERO principle: “release your text in the wild, even if it may not correspond to your standards.” Every text is a work in progress. Especially in a context where you’re likely to get feedback (i.e., blogging). Trial and error, with a feedback mechanism. In my experience, feedback on writing tends to be given in a thoughtful and subtle fashion while feedback on ideas can be quite harsh. The notion of writing styles is relevant, here. Some of Hugh’s arguments about the need for blogging in academia revolve around the notion that “academics are bad writers.” My position is that academics are expert writers but that academic writing is a very specific beast. Hugh’s writing standards might clash with typical writing habits among academics (which often include neologisms and convoluted metaphors). Are Hugh’s standards appropriate in terms of academic writing? Possibly, but why then are academic texts rating so low on writing standards after having been reviewed by peers and heavily edited? The relativist’s answer is, to me, much more convincing: academic texts are typically judged through standards which are context-specific. Judging academic writing with outside standards is like judging French writing with English standards (or judging prose through the standards of classic poetry). Still, there’s something to be said about readability. Especially when these texts are to be used outside academia. Much academic writing is meant to remain within the walls of the Ivory Tower yet most academic disciplines benefit from some interaction with “the general public.” Though it may not be taught in universities and colleges, the skill of writing for a broader public is quite valuable. In fact, it may easily be transferable to teaching, especially if students come from other disciplines. Furthermore, writing outside one’s discipline is required in any type of interdisciplinary context, including project proposals for funding agencies. No specific writing style is implied in blogging. A blogger can use whatever style she/he chooses for her/his posts. At the same time, blogging tends to encourage writing which is broadly readable and makes regular use of hyperlinks to connect to further information. In my opinion, this type of writing is a quite appropriate one in which academics can extend their skills. Much of the preceding connects with peer review, which was the basis of Mark Liberman’s post. In academia’s recent history, “peer reviewed publications” have become the hallmark of scholarly writing. Yet, as Steve McIntyre claims, the current state of academic peer review may not be as efficient at ensuring scholarly quality as its proponents claim it to be. As opposed to financial auditing, for instance, peer review implies very limited assessment based on data. And I would add that the very notion of “peer” could be assessed more carefully in such a context. Overall, peer review seems to be relatively inefficient as a “reality check.” This might sound like a bold claim and I should provide data to support it. But I mostly want to provoke some thought as to what the peer review process really implies. This is not about reinventing the wheel but it is about making sure we question assumptions about the process. Blogging implies public scrutiny. This directly relates to transparency, discussed above. But there is also the notion of giving the public the chance to engage with the outcomes of academic research. Sure, the general public sounds like a dangerous place to propose some ideas (especially if they have to do with health or national security). But we may give some thought to Linus’s law and think about the value of “crowdsourcing” academic falsification. There’s a lot more I want to add but I should heed my call to RERO. Otherwise, this post will remain in my draft posts for an indefinite period of time, gathering dust and not allowing any timely discussion. Perhaps more than at any other point, I would be grateful for any thoughtful comment about academic blogging. In fact, I will post this blog entry “as is,” without careful proofreading. Hopefully, it will be the start of a discussion. I will “send you off” with a few links related to blogging in academic contexts, followed by Hugh’s list of arguments. What have journals done for you lately?